P0031 A/F SEN 1 HTR (B1) (HO2S heater control circuit low bank 1 sensor 1) The current amperage in the A/F sensor 1 heater circuit is out of the normal range. P0032 A/F SEN 1 HTR (B1) (HO2S heater control circuit high bank 1 sensor 1) The current amperage in the A/F sensor 1 heater circuit is out of the normal range. Before performing the following procedure, confirm that battery voltage is more than between 11 V at idle. Start engine and let it idle for at least 10 seconds. Is 1st trip DTC detected? YES >> Proceed to EC-176, "Diagnosis Procedure". Disconnect air fuel ratio (A/F) sensor 1 harness connector. Also check harness for short to ground and short to power. NO >> Repair open circuit, short to ground or short to power in harness or connectors. NO >> Replace malfunctioning air fuel ratio (A/F) sensor 1. Refer to EM-30, "Exploded View". 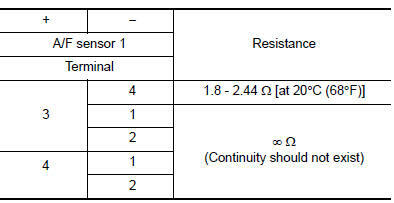 Check resistance between A/F sensor 1 terminals as per the following. NO >> Replace air fuel ratio (A/F) sensor 1. Refer to EM-30, "Exploded View".